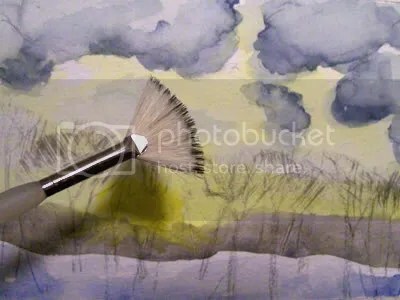 Let’s Paint a Frosty Winter Morning! – Let's Paint Nature! Let’s Paint a Frosty Winter Morning! The sun rises behind the forest and sets the sky on fire! I love when winter reveals hot colors during very cold weather. How ironic the sky teases us with it’s warm yellow tones, only to be an illusion as I shiver to the bone! Oh but I love it, even still the more! Inspired my this sunrise, I decided to do a quick watercolor painting. So let’s go! 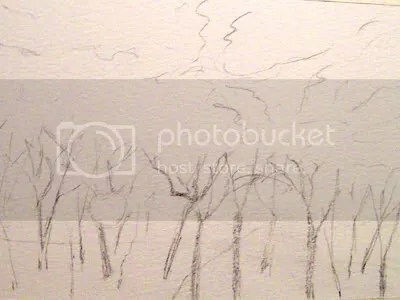 Step 1: On a piece of 10×8 Canson 140lb Watercolor paper, I drew a light sketch with a #2 pencil. Just to map things out. Step 2: Lightly spray your paper with a spray bottle. I’m working small here and I have a tendency to over saturate my paper…so a little spray will do. Next, start with yellow (I used Winsor yellow watercolor) and make the horizon line and some spots in the sky. Leave a little white space around your yellow paint and lay down some blue colors (Cotman indigo) in the sky. 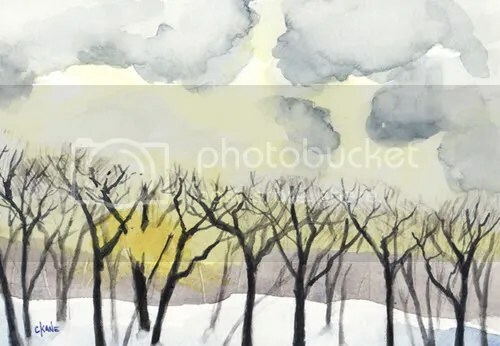 Try not to let the blue and the yellow touch too much because that will make a very angry green sky and we want a peaceful frosty sky. Lastly, mix some blue and brown for a line of distant trees, way in the back above the horizon line. Lastly, take a little cobalt blue and shadow the snow in the foreground. Step 3: Here’s a cool trick…take a dry fan brush, add some of that blue/brown mixture and make some twigs on the top of your oak trees in the shape of an umbrella for each tree. Easy, easy, easy way to make it look like a million little twigs without pulling all of your hair out. Much less pain this way too. Just don’t get carried away in this step even though it’s so much fun. Step 4: Establish some trunks. Darker in the front, lighter (water down the paint) in the back and don’t forget to vary the trunk size, a common mistake, make some thick and some thin. Important: to make it look like the sun is shining bright, do not have your tree trunks go all the way through the sun. Skip over it and continue out the other end. This gives the illusion of great brightness. Another easy trick! Step 5 Final: Now, you have to connect the trunk to smaller branches. 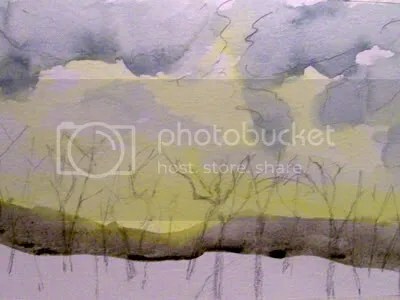 In my painting I have oak trees. Oak trees have the most beautiful stout squiggly top branches. Not long and straight like the maple. So in this step I took a rigger brush and a lot of watery paint and wiggled a little when I painted the branches. Wiggling is fun, even as an adult. 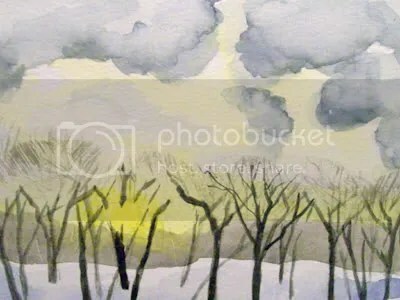 Frosty Winter Morning Original watercolor image is 7×5 and placed in a white mat, outside dimensions 10×8. I hope you enjoyed this step by step watercolor demonstration of a frosty winter morning! Lovely painting with great WIP pics! Thanks Chris! I hope it helps! 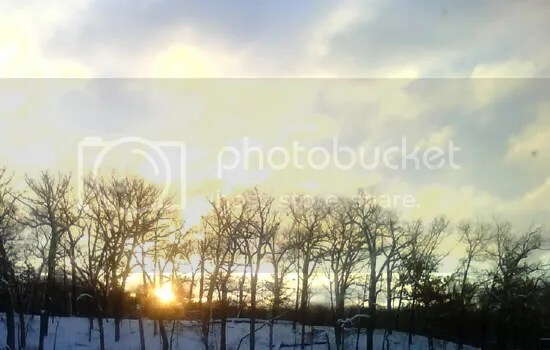 An endearingly joyous dance of sunlit trees uplifting to the skies on a cold day’s dawning.